To celebrate the 60th anniversary of the release of the FROM RUSSIA WITH LOVE novel (1957) Ian Fleming Publications has a contest that ends tonight at the end of the Easter holidays (2017-04-17). The contest is open to everybody and the task is to conduct your very own cover design for the novel. The second to forth runner up will receive the fantastic Folio Society From Russia with Love edition that has been signed by artist Fay Dalton. 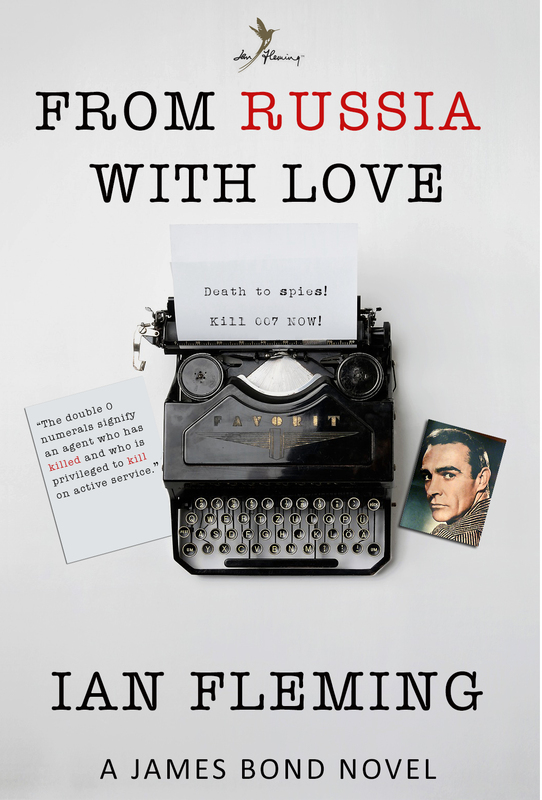 And after that there will be ten raffle prices containing of a brand new copy of the From Russia with Love paperback. You can read all their rules here. All entries will be judged on accuracy to the From Russia with Love novel and imagination and aesthetically pleasing design. So I am not a graphics designer but I did feel I wanted to take part in this contest just for the fun of it. Below you can see my design and some comments on why I decided on this design. My first plan was to take the Cape first edition cover and remake it in a photo instead of a drawing. But it was to troublesome to get hold of a revolver that looked like the one used on the first edition and time was short. Secondly I felt that the most common used designs were those of the Orient Express, Istanbul and Tatiana Romanova. Therefore I did not want to use that and went for the below design instead. 1. 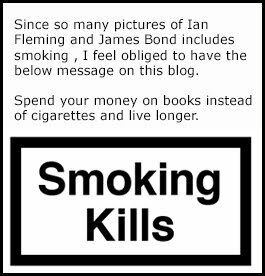 First of all I wanted to use the Ian Fleming Publications logo highly visible. I really like the logo and feel that it should have a proud place on the cover. 2. The font for the title is called Typewriter-Serial and gives the book a "classic" feel without using the word classic. The font is used almost across all text on the cover. 3. SMERSH stands for SMIERT SPIONAM which translates to "Death to spies" used on the paper in the typewriter. I wanted to use the translation to make the book more accessible to the common reader and not just us Bond fans who knows what Smiert Spionam is. I also wanted to use the "007" somewhere on the cover. 4. The picture of the typewriter is partly the order to kill Bond but also to represent the decoding machine that Smersh use to trick Bond in Istanbul. 5. On the left side is a quote from the book that is accessible to anybody who has seen a James Bond film which makes it highly recognisable to the common man. On the right side is an early picture of James Bond that Tatiana Romanova has fallen in love with in the novel. The photo is of Sean Connery that (I believe) was taken before Dr. No started filming in 1961 to promote Connery as Bond. It is also one of the few things that gives this cover design some colour. I know Ian Fleming Publications does not use the face of James Bond on their covers and that Sean Connery would not approve of the use of his face (if not Eon still has all rights to this photo) but I see the picture as a time related piece just like the typewriter font. 5. At the bottom of the design it says "a James Bond novel" in the Calibri font. This is planned to be used on all the novels just like the top IFP logo. The font could then maybe be used on the spine to make all 14 books appear in sync. So there you have it. Let me know in the comment section below what you think and maybe what you would have done different.